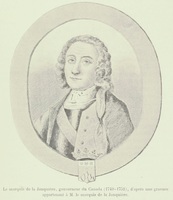 LEVASSEUR, RENÉ-NICOLAS, head of royal shipbuilding and inspector of woods and forests in Canada; probably born at Rochefort, France, in 1705 or 1707; d. 2 Aug. 1784 at Aubagne, France. René-Nicolas Levasseur belonged to a family that had been associated with the Marine for nearly a century. Members of it had held the offices of intendant and financial commissary, and his father had been engaged in naval construction. First a shipbuilder in Rochefort, in 1717 the elder Levasseur had become chief supervisor of naval construction at Toulon. René-Nicolas was to follow faithfully in his father’s steps, serving as an apprentice under his orders; one of his brothers became an engineer and the other, Louis-Armand, became financial commissary of Rochefort. 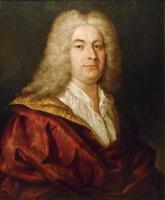 René-Nicolas entered the king’s service in 1727 as assistant shipbuilder at Toulon. In 1733 he supervised the building there of a 40-gun ship, the Aquilon. He was by now experienced and reliable, priding himself on his honesty, zeal, and usefulness, and he was ready for all the tasks he would assume in the colony. In the spring of 1738 the minister of Marine, Maurepas, finally responded favourably to the request that colonial authorities had been making for more than 20 years for a royal shipyard at Quebec. At the same time he announced that René-Nicolas Levasseur was being sent to manage the operation. Levasseur sailed for Canada immediately and took up residence in Quebec with his wife, Angélique Juste, and their children in a house on Rue Champlain, near the future shipyard. That autumn Intendant Hocquart sent him into the forests to verify information gathered in previous explorations [see David Corbin*; Médard-Gabriel Vallette* de Chévigny], to specify the quantity and quality of wood needed for the yards, and to choose the regions to be exploited. Subsequently Levasseur returned to the forest nearly every year, looking for wood suitable for ships of 500 to 700 tons burden. The shipbuilding enterprise was the result of the minister’s decision to increase the number of warships in the royal fleet in case of armed conflict with Britain. Previous estimates, except those of the expert Vallette de Chévigny, proved to be too optimistic however: the wood required for building large ships was becoming scarce and expensive and was of mediocre quality. The forest resources of Canada would have been more suitable for constructing merchant ships of 250 to 300 tons. The decision taken in France caused misgivings and created all kinds of difficulties. The trees had to be felled in the distant region of Lake Champlain, the operation cost more than had been foreseen, and to obtain lumber of the required dimensions wood of poor quality had to be used. Hence the enterprise in the colony fell into disrepute which increased when big ships, such as the Caribou, a flute of 700 tons launched in 1744, rotted in less than five years. Organizing the work left Levasseur practically no free time. Once the cutting areas had been marked out, he would return to Quebec to prepare for the summer season, draw plans for future ships, and procure the supplies needed for their construction. But he often had to return to the forest before the end of winter to supervise woodcutting, make sure he would have all the logs necessary, and arrange for them to be floated from Lake Champlain to Quebec. From April to November or December he had to coordinate and supervise all the workmen in the shipyards. In 1746 the yards, which had first been located on the Rivière Saint-Charles at the spot where private individuals were accustomed to build ships, were moved to Cul-de-Sac, not far from the Place Royale. Because of its depth the St Lawrence was better suited for launching big ships than the Saint-Charles. In summer some 200 men supervised by a dozen foremen from France worked on the site from early morning until nightfall. The tempo of work made it possible to build a ship in two years. From 1738 until the conquest Levasseur launched about ten warships, plus some small service craft. He undertook to train his son Pierre and Louis-Pierre Poulin* de Courval Cressé as assistant shipbuilders and they built light warships to cruise the lakes at the time of the Seven Years’ War. These successes were not achieved without difficulty. The home authorities considered the cost of the vessels excessive. The search for large logs was costly. It took all Levasseur’s imagination and tenacity to deal with almost catastrophic situations. Setting up and then moving the shipyards entailed a considerable outlay of money. He even had to complain of the exactions of colonial administrators. Some of them – for example Jacques-Michel Bréard – made personal use of the services of foremen paid by the king and wood intended for building the king’s ships. The scarcity of manpower at all times made it necessary to pay high salaries. At first craft masters qualified to take charge of the various workshops had to be brought from France. Later the intendant was obliged to ask the minister year after year for ordinary journeymen in order to ensure the survival of the enterprise, since Canadian labour was becoming scarce. Despite the good will of the builder and the colonial authorities, the difficulties resulting from the system and from the economic situation meant that the shipbuilding programme could not attain its objectives. It served only briefly as the catalyst for private enterprise that Hocquart had wished for. After remarkable progress from 1739 to 1742, the secondary industries – rosin and pitch for caulking, linen and hemp for cordage and sails, iron for nails and tackle – rapidly declined. A slump in agriculture in 1742 and 1743 caused such a large rise in prices that the small contractors, who could sell only at prices fixed by the intendant, went out of business. From 1744 on, Levasseur had to order from French arsenals essential parts for completing the ships. When the British navy undertook to blockade the St Lawrence, particularly after 1756, the operation was seriously threatened. Moreover, the royal enterprise monopolized material and human resources to the exclusion of private enterprise. Satisfaction of France’s needs had been achieved to the detriment of the colony’s development. Of Hocquart’s plan there remained only a metropolitan industry which had been implanted in a colonial setting to derive greater profit from its resources. In contrast to the Saint-Maurice ironworks, where administrators, foremen, and workmen were not always qualified, the shipyard had in Levasseur a competent and conscientious man. His work was unanimously and constantly praised, despite failures such as the loss of the Orignal, which broke her back on the day of her launching in 1750. He was sought out whenever there were serious difficulties. He was the expert who had to solve the problems presented by the supply of wood. His methods of floating wood allowed rapids to be passed without danger. He had to blast dangerous rocks in watercourses. It was he, rather than the king’s engineer, Gaspard-Joseph Chaussegros* de Léry, who was charged with building the quays when the shipyards were moved to Cul-de-Sac. He had come to New France as an assistant shipbuilder with an annual salary of 1,800 livres; the following year he received letters patent as a shipbuilder, and in 1743 his salary was increased to 2,400 livres. In 1749 he became chief shipbuilder and in 1752 was appointed inspector of woods and forests. Every ship-launching also meant important gratuities for him. During the siege of 1759 he was called upon to direct the squads of workmen responsible for fighting the fires which resulted from the bombardment of the city. The colonial administrators never lost their confidence in Levasseur’s talents and effectiveness. The French authorities were also to recognize his aptitudes and put them to use. He lost almost everything in the war. During his voyage back to France in 1760 the ship put into port on the coast of Spain, and he had to leave his family at Bayonne, near the Spanish frontier, for lack of money. The minister of Marine granted him l,200 livres a year for his upkeep. In addition the minister quickly found a way to make use of his competence, putting him in charge of exploitation of wood in the Pyrenees to supply Bayonne with masts. For this challenge, with which the administration had been struggling for nearly 30 years, Levasseur once more received a salary of 2,400 livres. He succeeded so well – with the court’s congratulations, as his personal file records – that he was appointed commissary of the Marine on 21 May 1764. When he asked to be retired in March 1766, he received a pension of l,800 livres. However, the memory of his exceptional services gradually faded. His son Pierre, who had become a writer in the Marine after the family returned to France, was refused his letters patent as deputy commissary. 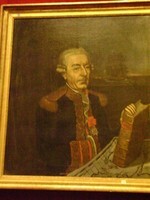 At Levasseur’s death in 1784 his wife had great difficulty in obtaining the minimum pension of 600 livres awarded the widows of commissaries of the Marine. The able and effective man of action had been forgotten. Jacques Mathieu, “LEVASSEUR, RENÉ-NICOLAS,” in Dictionary of Canadian Biography, vol. 4, University of Toronto/Université Laval, 2003–, accessed April 24, 2019, http://www.biographi.ca/en/bio/levasseur_rene_nicolas_4E.html.